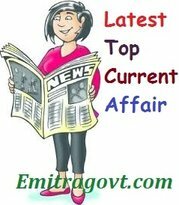 Current Affairs Question 2017: Looking for 19th September Current Affairs. Then start your Quiz right now by answering them. Here in this article, we are giving the Current Affairs Quiz with Questions and Answers. As many people are preparing for various government exams it became mandatory for them to get a grip over the current affairs as in most of the tests are based on Daily Current Affairs. By taking this kind of Current Affairs Quiz candidates can eventually get hold of what they have been working on. Contenders can trust us as we will update all the latest Current Affairs in this quiz. For more such quizzes check our site Emitragovt.com regularly as we will update the Daily Quiz for current affairs. 1. Distinguished Hindi story writer and dramatist, Surendra Verma, will receive Vyas Samman on September 20. 2. The book titled Unstoppable: My Life So Far authored by tennis star Maria Sharapova has been unveiled. 3. Haryana Chief Minister Manohar Lal Khattar launched the ‘HARPATH portal’ for mapping roads in the state. 4. Bollywood superstar Salman Khan has been honoured with the Global Diversity Award 2017 in the British Parliament House. 5. Hollywood actor Harry Dean Stanton died. He was 91. 6. Afghanistan spinner Rashid Khan has become the youngest cricketer to take 100 wickets in T20s. 7. The oldest person in the world, Violet Mosse-Brown, has passed away recently. She was 117. 8. India’s first Centre for Animal Law has been established at the city-based NALSAR University of Law in Hyderabad, Telangana.